My Creative Existence: The scrap drought has broken! It's been aaaaaaaaages since I've done a scrapbooking layout! What with work, Christmas, moving house, and my daughter starting school, I just haven't had the time! 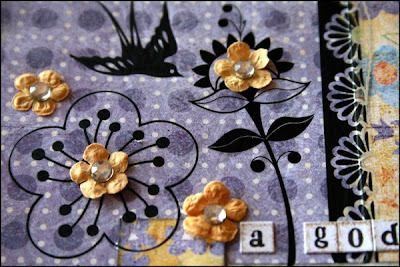 Well, I am pleased to say the drought has broken, and I have created my first scrapbook page for 2009! 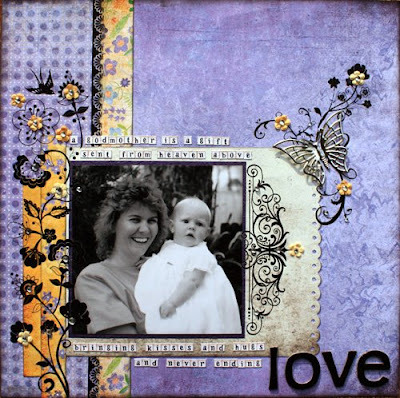 My cousin (the woman in the picture) asked me to do a layout for her to give as a gift to her god-daughter (the baby in the photo) who has just turned 21! My only instructions were "Purple" and "Butterflies"! 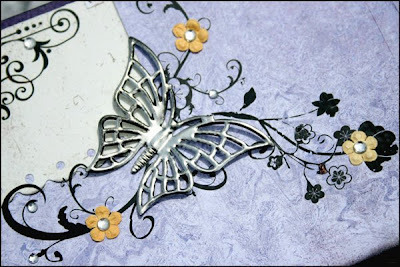 Now, butterflies I have plenty of, but I don't have a lot of purple papers in my whopping stash! LOL! But I eventually found some from the Basic Grey "Oh Baby" range from years ago that suited the layout perfectly. Hi Sarah, what a fantastic page, Kay must have been thrilled with it! How are you?? - Glad you've broken your drought , LOL, but I've been peeking at all your creations in previous posts and I'm loving what you've created with the pixma - that shirt is way cool! !